Potential oil exploration in the Great Australian Bight continues to receive significant public attention in South Australia. APPEA highlighted the benefits and opportunities of exploration in the Great Australian Bight at two forums in Adelaide on March 19. 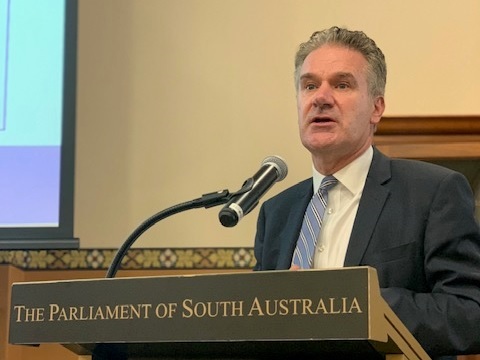 The first event was a breakfast briefing hosted by the South Australian Chamber of Mines & Energy, which was followed later in the day by the first meeting of the SA Parliament’s Friends of Resources Group. Both forums featured industry presentations by APPEA and Equinor, the Norwegian company proposing to drill the first well in the Bight since 2003. APPEA’s SA Director Matthew Doman spoke about the benefits and opportunities that could come from successful exploration in the Bight, while highlighting the industry’s commitment to safe, sustainable operations and genuine engagement with coastal communities and other users of the marine environment. He highlighted key economic findings from a recent independent report showing how oil exploration and subsequent development offshore would benefit the state and national economies. Also presenting at the forums was NOPSEMA, the offshore oil and gas regulator. NOPSEMA reiterated the importance of industry recognising community concerns and undertaking effective consultation and engagement.